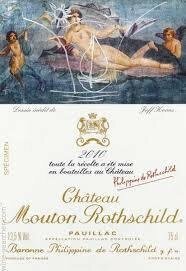 Wine Advocate 99 - Tasted at the Mouton-Rothschild vertical in London, the 2010 Mouton-Rothschild is a modern-day benchmark for the First Growth and here, side-by-side with the 2009, it certainly has its nose in front. It is in possession of quite breathtaking delineation and precision, a crystalline bouquet with black fruit laced with minerals, potent pencil shaving notes, a touch of cold slate. It is totally entrancing. The palate has beguiling symmetry, but for me what really distinguishes this Mouton is its effortlessness. Like watching Usain Bolt in his prime sprinting to another world record, this wine is almost self-effacing in terms of its brilliance. Will Philippe Dhalluin ever better this Mouton-Rothschild? Keep it in the cellar for 15 years, if you know what's good for you. Tasted May 2016.